First Impression: Her shoulder has a face! Second Impression: Well, you have to use your imagination. But look! Our backdrop here are some sort of Alps, and you know that Heidi’s grandfather shakes his head with gentle disapproval before turning away and tending to his goats. I hope Heidi is learning everything she can in Frankfurt, he muses. 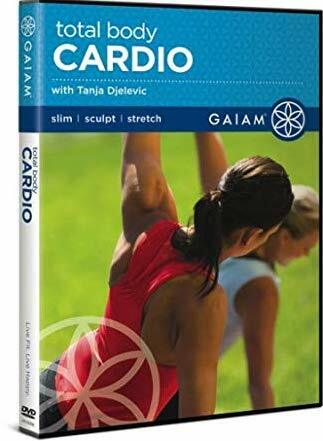 “No muscle will feel left out of this high-energy cardio workout,” alleges the DVD back cover. The spirit of inclusivity extends to the apex predators in the ecosystem, who are no doubt lurking, just out of camera range, for the weakest of the herd to wander off so they can help themselves to a tasty meal of people tartare. Instructor Tanja Djelevic and her two besties aerobicize merrily on, blissfully unaware of the perils of the mountains. We start with 30 minutes of leg lunges, plyometric jumps, and such. Ladies! Dusk is upon us! The night is dark, and full of terrors! Pack up your capri stretch pants and vamoose! But then we have the option of sticking it out for another 20 minutes of crunches and fun time stretchy-stretchy. The fit trio remain, determined to help define your rectus abdominis, which is a funny bit of Latin no matter how serious the situation. What fresh hell is this? What kind of monster would advocate such a barbaric practice? Then it clicks. Tanja’s playing the long game. She’s wearing down her gal pals so she won’t be the slowest one when everyone has to run for it. Eyes on the prize, Tanja. Craftily done.